Every year hundreds of companies graduate from the U.S. Small Business Administration’s certified 8(a) set-aside program; not all of these companies are able to compete effectively in a full and open market. 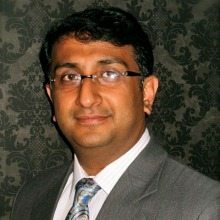 Manish Malhotra is the President and CEO of Unissant, Inc., a big data analytics firm preparing for a successful 8(a) graduation in summer 2016. We followed up on our 2011 interview to discuss his leap from financial services exec to entrepreneur as well as the company’s recent accolades, including its Washington Technology Fast 50 listing and finalist nomination for SECAF’s Program of the Year. A self-proclaimed “gadget freak”, we couldn’t finish our interview without discussing how the Internet of Things (IoT) is molding the way Malhotra is positing his company for growth. WashingtonExec: You had a successful career in the financial services industry, which is a little different than some of the other CEOs that we interview. What made you want to leave that industry and start your own company in federal IT? Manish Malhotra: In the private sector, my focus was always on information management and data analytics and assisting companies to harness the power of their data. I was speaking regularly at industry events and conferences about data concepts, data classification and data privacy when I began getting approached by a lot of our customers – which became Unissant’s current customers — both from the private sector as well as the public sector. They were looking for robust data solutions. I realized that there was a much larger demand for data analytics work beyond my current position and decided to start my own shop that would focus on some of these areas. That was the initial start of Unissant, which at the time, was called BI (or Business Intelligence) Methods. At BI Methods our focus was on making sense out of all the information an organization collects. In turn, we were helping clients make better, timely and informed decisions. Data is like a raw material; it needs to be mined and analyzed to become actionable. WashingtonExec: How are you preparing for graduation from SBA’s 8(a) program? Manish Malhotra: Yes, Unissant will graduate from the 8(a) program in July 2016. Let me start by saying that the 8(a) program is like a cliff: many companies make the arduous trek all the way up only to fall off the edge. All too often there is no soft landing for 8(a) companies – it’s like suddenly the rug is pulled right from under their feet. Fortunately, there is guidance around how companies should use the 8(a) program. Companies should begin the transition phase four years after they begin the program. This means focusing on non-8(a) business and using the program to get a foot in the door and earn new business. Essentially, the transition is about becoming more of a capability driven company than an 8(a)-specific, program driven company. In accordance with the guidelines, we actually started transitioning three years back, phasing out our 8(a) work gradually. Today less than 10 percent of our business is 8(a) business. I’m hoping that going into next year we will bring that number further down. Hopefully we won’t face the issue that a lot of other 8(a) companies face. In parallel, Unissant is aggressively pursuing new contracts that focus on data analytics and big data solutions in the financial and healthcare markets. And although we are primarily a federal contracting company, we are currently expanding our private sector portfolio as well. Essentially, the transition is about becoming more of a capability driven company than an 8(a)-specific, program driven company. In accordance with the guidelines, we actually started transitioning three years back, phasing out our 8(a) work gradually. Today less than 10 percent of our business is 8(a) business. I’m hoping that going into next year we will bring that number further down. WashingtonExec: Individuals have different mind sets regarding whether they want to continue their career as a VP of a big company or, do what you did, and go out on their own as a CEO. What kind of leadership qualities do you think differentiate people who might be great at their job but not necessarily have the same qualities as you at being an entrepreneur? Manish Malhotra: The main criterion is the desire to make a difference using the knowledge that you’ve gained in your domain. I just wanted to make a difference. That’s why I started the company. It was not about ‘we need to start a company to make money’. In fact I didn’t even know what the 8(a) program was when I started Unissant. The question you need to ask is “are you able to bring that passion and also energize other people who are going to join you either immediately or as you grow the company?” “Are you able to inspire the people that are going to be working with you with the same passion that you have?” Normally a small business is started because one person has a passion about doing something. These companies then face challenges because not everyone who works for that company has the same passion. So if you are considering starting a company and becoming an entrepreneur, you need to ask yourself “Are you able to energize people to work with you and get the company and concept going?” That’s what I believe is required. You cannot just say “I’m going to start a company tomorrow”, not having a plan, not knowing what you are going to do. WashingtonExec: We first started to schedule this interview because you were listed on Washington Technology’s Fast 50. We also work closely with the SECAF Awards and I know that you were nominated this year. Could you talk a little bit about these honors? Manish Malhotra: Yes, so earning a spot on the Washington Technology Fast 50 list was a huge privilege. With SECAF we were nominated and selected as finalists for the “Project of the Year” Award. That award was more around delivery and our customer focus, something in which Unissant strongly believes. We want to grow as a company but we don’t want to lose our eye on delivery. This particular nomination was around our US Mint program. This was a program that we worked on for the past two years where we actually were invited by Mint to run a PMO (Program Management Office) for a fairly large implementation. The project involved leading the revitalization of USMint.org from which the US Mint actually sells coins and currencies to generate revenue. From the site, the US Mint makes about $500 million in their coin sales annually, so this was a fairly critical system. The US Mint had conducted a study showing that the current system only had about 24 months left before becoming completely obsolete. As the PMO for the delivery, we had a huge task to implement an excellent system within the timeframe. From requirements gathering to complete business analysis and testing, we were on point for the entire project. And of course, given that this was a very high visibility program, we needed to make sure that it was delivered on time and on budget. And I am proud to say that is what Unissant did. I believe that’s what was picked up by SECAF and why we were chosen as a finalist. Furthermore, because this program was so critical for the US Mint and Treasury in general, we got a lot of accolades from the Deputy CIO of Mint and other stakeholders. As part of our nomination, we were actually able to share a written letter from the US Mint stating how critical this program was for the Mint and how well Unissant had done. WashingtonExec: Do you have another case study that you want to share? Manish Malhotra: We are doing a significant amount of work in the big data space We participated in a fairly large big data project for a quasi-federal financial institute where we were actually processing terabytes of data and trying to do analytics on top of that which was very successful in terms of the volume of data that we had to handle. If we talk about big data it is all around volume, variety veracity and velocity. In this particular case it was more volume and to some extent velocity because we had to process millions of records on a nightly basis. WashingtonExec: We have an ongoing series on the topic of the Internet of Things. Do you have a favorite IoT device or application? Manish Malhotra: If you read my leadership profile on Unissant.com, you will see that I end by saying I am a gadget freak. I like to be on the leading edge of technology. I have every possible gadget that you can think – at least from a consumer’s perspective. The IoT (Internet of Things) is nothing but huge amounts of data being manipulated by all of these sensors and such. That’s where a company like Unissant plays a big role because we do data analytics on that big data. Not only do I have Nest, I own an iWatch and I have a Tesla, a connected car generating tremendous amounts of data and sending it back to Tesla. Using that data, the car can actually calculate and tell me the best route I can take every day when I go from work to home. The car is actually learning every day that I am using it. I am also a big fan of Nest which is now a part of Google. The Nest has four sensors built into it – it’s not just a simple energy saving device, it has a sensor that detects if I am at home or not and can automatically adjust temperature settings appropriately. I am a huge fan of all of these gadgets. WashingtonExec: Is there any gadget that you would not purchase for privacy or security concerns? Manish Malhotra: So far nothing is on that list. There are apps that I do not use due to privacy reasons. Obviously a lot of us have the iPhone 6 which is generating tons of data and probably sending it back to Apple but there are certain apps on that platform which I am scared of because they could potentially get into your contacts and send all of that information back. That concerns me. I am careful about which apps I authorize to use my platform in general. WashingtonExec: Those are all of the questions that I have for you. Is there anything else that we didn’t talk about that you would like to discuss? Manish Malhotra: I truly believe that the Internet of Things is all about lots of data and that is where Unissant’s expertise lies. I’m looking forward to being a part of that. I’m already part of the Big Data Council and recently had an excellent conversation with the FDIC CIO. I will add that as we talk about data and the Internet of Things, what we continue to forget is data governance. That was evident from the FDIC CIO when he was talking about his initiatives and how he wanted to make sure data governance was the first on his priority list. That is what Unissant is focusing on right now. I look around at all the cool things happening across technology – both government and consumer with cloud, big data, IOT, mobile, etc. It makes me really excited to live in the world at this time. I think there are amazing things coming in the future and I look forward to Unissant being a part of that.